In October 2017, Sotheby’s sale Howard Hodgkin: Portrait of the Artist focused on the myriad objects across Indian and Islamic Art, European sculpture, rugs, textiles and furniture that Howard had collected throughout his life and which provided much inspiration for his own work. The auction captured the imagination of thousands of visitors and bidders across the world. 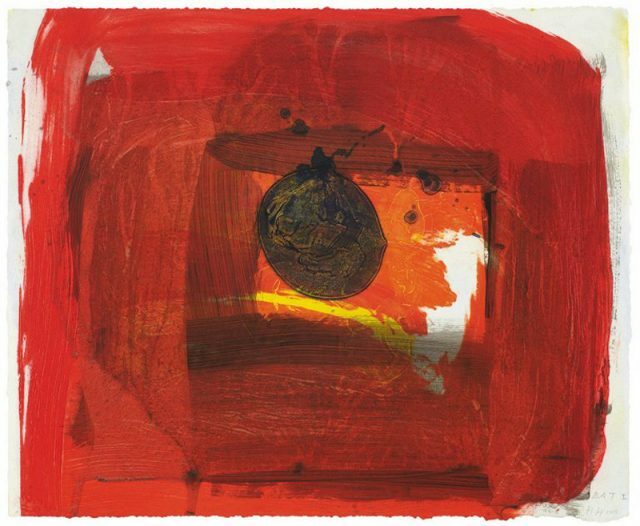 Howard Hodgkin: Working on Paper will reveal the scope, diversity and ultimately the great passion Hodgkin had for working on paper. Alongside stage designs for the Royal Ballet and Mark Morris Dance Group, commissions from projects such as the 2012 Olympic poster and book covers for his friends Julian Barnes and Susan Sontag, the auction will include a significant proportion of dazzling prints from the 1960s up to some of the last works he produced. Every print in the sale is an Artist’s Proof, retained by Hodgkin in his personal collection. The exhibition will go on view to the public in Sotheby’s New Bond Street galleries on Friday 9 June 2018, as part of this summer’s Modern British Art Week. 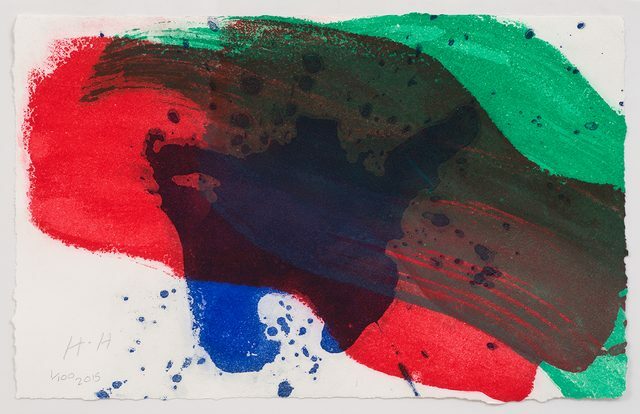 On Sunday 10 June, Sotheby’s will host ‘The Journey of Making: Howard Hodgkin Working on Paper’, a gallery talk with Hodgkin’s printmaker Andrew Smith. 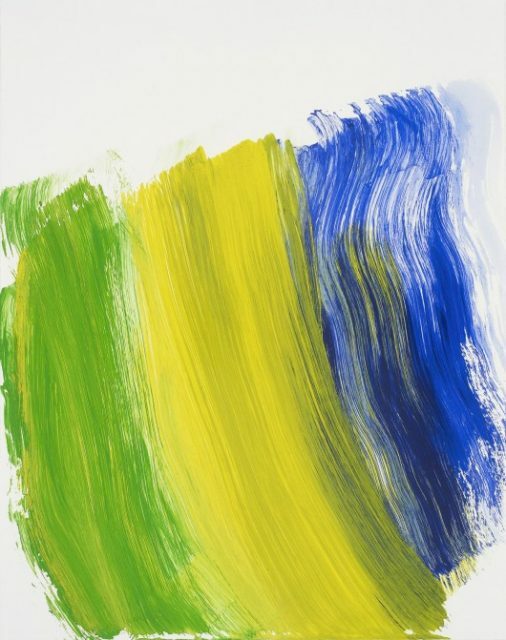 Following the auction, the proceeds will fund a complete museum collection of Hodgkin’s graphic work that is fully accessible for the public to see and enjoy, as well as supporting a new edition of the artist’s Catalogue Raisonné, which will feature 189 prints and many unique works on paper. Hodgkin created prints for just over half a century and every time he put his hand to a series it set a new standard for the medium.2 With a deep understanding of the sophisticated techniques required to bring out the desired colours and textures, unlike many others that preceded him, Hodgkin’s printmaking methods were incredibly ambitious, spontaneous and hugely experimental. Hodgkin employed an enormous variety of printmaking techniques, from lithography, to screen-printing, to intaglio works with additional carborundum and hand-colouring. He also experimented in scale, creating prints that vary from just over 10cm tall and 15cm wide, to works as large as two and a half metres tall and six metres wide. His method of layering three or even four different printmaking techniques gave new potential to the medium. The result was a painterly fusion of rich printed colour with the more immediate and luminous hand-colouring. He also enjoyed the collaborative aspect, seeking master printmakers who would understand the specific feeling and function of each hand-made mark3. Hodgkin both loved and knew a great deal about the performing arts. Even as a child he was interested in designing for the theatre, but had to wait to fulfil this dream until he was wellestablished as a painter. He received his first commission in 1981 following a fortuitous meeting with Richard Alston, then the director of the Rambert Dance Company, with whom he worked on the 1981 dance Night Music. This first excursion into the theatre sparked a thirty-year foray into producing sets and costumes designs for a plethora of ballets, dances and operas – culminating in a collaboration with the Mark Morris Dance Group on the epic love story of Layla and Majnun in 2016. The moving performance will make its London debut at Sadler’s Wells in November 2018. Hodgkin’s works seem to transfer naturally to the stage, with an ‘enclosed, intimate and magical quality that evokes the space of the theatre’5. However, it was no easy feat for an artist to visualise working on an imagined scale before the design was blown up as a huge background. He himself once said that ‘you don’t even know what you’ve made until you see it on stage, by which time it’s too late anyway’6. What makes these original designs quite so special is they bear witness to a particular creative moment, retaining the magic of the performance. Taking Ludwig van Beethoven’s first Concerto as the starting point, choreographer Ashley Page put together ‘Piano’ for the Royal Ballet in close collaboration with Hodgkin. As well as the exuberant backdrop, which was gradually revealed throughout the performance, Hodgkin designed the costumes both for the five principals and for the corps de ballet. The ballet premiered at the Royal Opera House Covent Garden on 6 October 1989. Reflecting on the production early that year, Page commented “I wouldn’t have wanted to make Piano without Howard. I chose him because his painting has the same qualities of formal grandeur and intimacy as Beethoven’s music, which we both love’. First performed by the Mark Morris Dance Group in March 1997, Rhymes with Silver celebrates the diversity of dance traditions. Starting with delicate Indian hand movements, a spectrum of styles unfold, from martial artist to dervish whirling, via old European court Balkan folk dance. In harmony with the world’s traditions unfolding together, Hodgkin’s striking design altered dramatically with each lighting change. Hodgkin had a lifelong interest in experiencing other places. France, Italy, Morocco, Egypt, America, and above all, India had a profound effect on him. His first trip to India in 1964 proved a revelation to the artist, who found the country captivating and carved out time to visit almost every year thereafter. An entry from an unpublished travel journey in 1970 captures a moment in time with the same distinctive sense of his paintings: ‘To Secunderabad. Gin and Lime at lunchtime. Rain in the afternoon with exactly matching Golconda skies – navy blue and white lined with receding pink’. Strongly evocative of the exotic horizon so beloved by Hodgkin, this hand-painted gouache comes from the Indian Wave series – an opus of sweeping tides of colour and gesture whose ebbs and flows are redolent of the coastline of India. Executed in 1990-91 in a workshop in Wiltshire with Jack Shirreff and Andrew Smith, these voluptuous pictures were stored away and forgotten about for over two decades until the printer retired and the workshop was emptied. In 2014, Gagosian Gallery celebrated their rediscovery with an exhibition of thirty works from the series. This sale will include two works that weren’t seen in that show and have only recently been rediscovered. 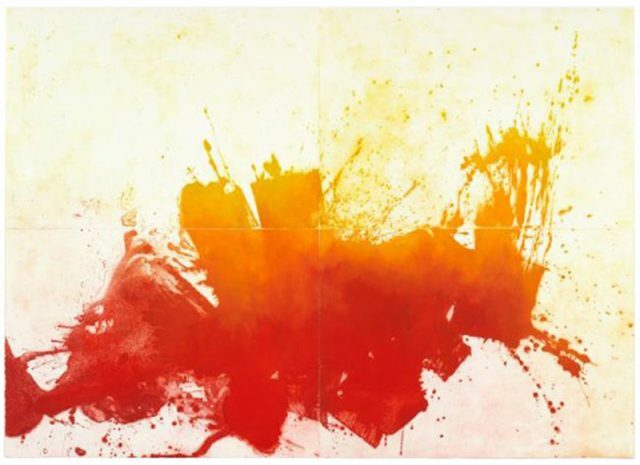 The series was painted on handmade Khadi paper that Hodgkin had brought home from India, composed of recycled cotton clothing and plant fibres. These variable raw materials brought delightfully random and unique qualities to the process, which the artist believed would serve to enhance the expressive potential of the work. By combining print and paint in opulent colours and a densely textured surface, Hodgkin here creates a complexity and richness that could not have been achieved in a single medium. 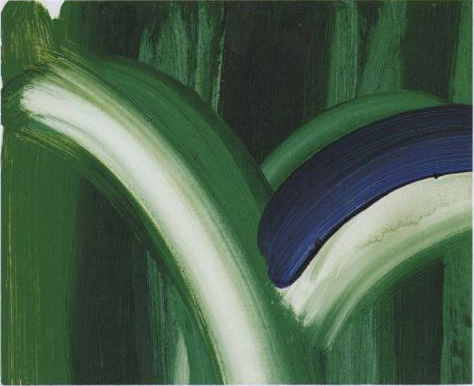 To Hodgkin, commissions were a vehicle to be introduced to different people and different subjects. Indeed in 1995, he almost stopped making prints altogether until he was asked to create Two’s Company for Elton John’s Aids Foundation, and so was inspired to continue. One of twelve leading British artists invited to design the official London 2012 Olympics posters, Hodgkin created the sumptuous deep blue Swimming. A ‘dreamlike metamorphosis of athlete and water, the diver and pool’8, it was widely regarded as the most successful poster. The sale also includes the original artwork for the explosive but concentrated Ice, which was created for Team GB for the Olympic Winter Games in Sochi, Russia in 2014 – an expression of intense physical prowess. Bold ad euphoric, The Road to Rio captures pure energy and spirit with assertive washes of Brazilian colour. Meticulously crafted, the screenprint is built up from twenty-two separate layers of exhilarating colour. 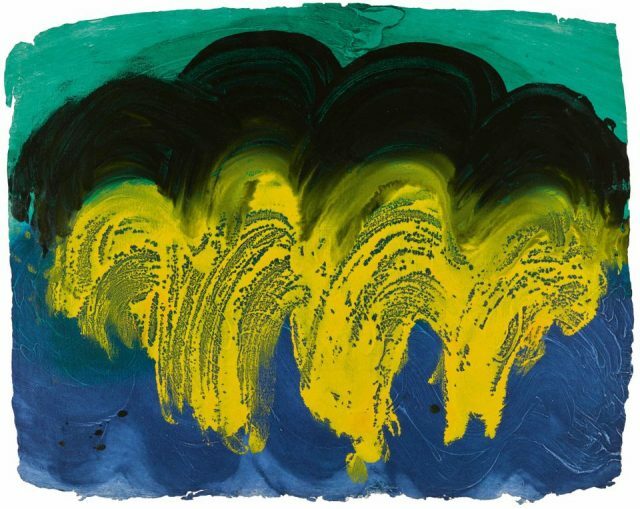 In the words of his close friend the writer Julian Barnes, ‘Howard Hodgkin is a writer’s painter’9. He attracted the attention of storytellers who were drawn to his vibrant compositions through his wonderfully narrative titles. The auction will include designs for book covers he created for Barnes and critical essayist Susan Sontag – rare examples of a painter doing the work of a graphic designer with aplomb. Exemplifying the style of Hodgkin’s final prints, For Antony was produced initially to contribute towards Antony Peattie’s new book ‘The Private Life of Lord Byron’, and upon publication it will be re-produced as end-papers.